Mei Lanfang, was born in a Beijing Opera family in Beijing on October 22, 1894. He is the most outstanding performances of Beijing Opera artists in China. Mei Lanfang made great contributions on cultural exchanges programs between China and other countries. He visited Japan in 1919, 1924, and 1956; He also visited the United States in 1930 and Russia in 1935 and 1952. During these visiting and performances, Mei Lanfang gained a great reputation; and, he got acquainted with many famous artists in the world. 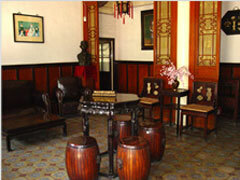 The residence of Mei Lanfang is located in Xicheng District. It is a typical Beijing courtyard houses, with an area of 1,000 square meters. Mei Lanfang spent the last decade of his life there. In September 1984, the residence was listed as a heritage that is "Mei Lanfang Former Residence". Memorial Hall was formally found in 1986, a large number of precious relics and literature were donated by Mei Lanfang's family in 1962. Address: 9, Huguosi Street, Xicheng District. Bus No. 22, 38, 47, 409, 626, 810 and 826, arrive at Huguosi; No. 13, 42, 55, 107, 111, 118, 701, 823 and 850, arrive at Huguosi.